Good morning. Since about midnight, while it has continued to rain, totals have been held down a bit. 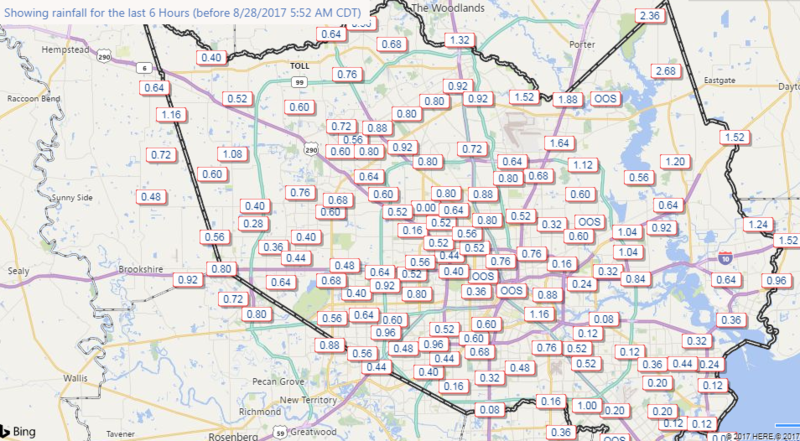 Most of Harris County has seen less than an inch in that time, while a few spots west of Harris County and to the northeast, especially into Chambers and Liberty Counties have seen 1-3″ of rain. No rain helps, but these sorts of rains don’t hurt quite as badly. Radar this morning is opening up on a mostly positive note for us. Yes, again, more rain in the area, but a better view than 24 hours ago, and much better than some forecast models had indicated even 8-12 hours ago. 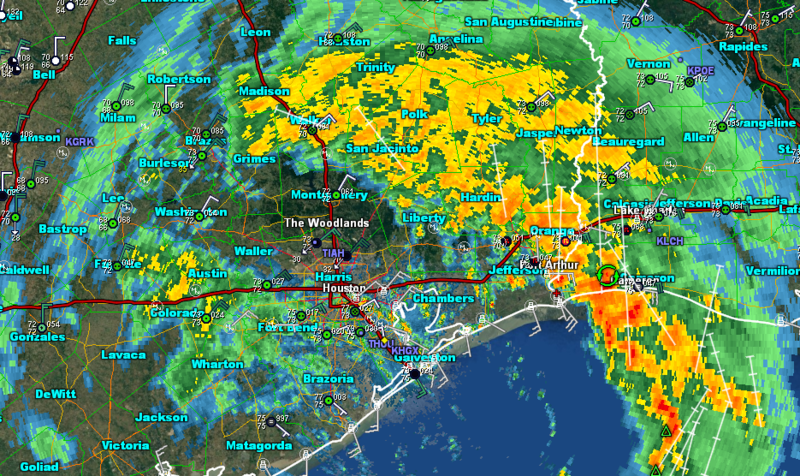 Radar as of 6 AM shows the heaviest rains oriented from about Beaumont and Lake Charles northwest to Livingston and Madisonville. (GR Level 3). Scattered showers persist west of Houston and in other parts of the area. Harvey has re-emerged in the Gulf near Matagorda. We, along with the National Hurricane Center, continue to believe that while Harvey will travel over the Gulf the next couple days, only modest re-organization is expected. Eric covered this in detail last night, and I see no reason things have changed much overnight. We don’t want you worrying about that, and everyone’s focus should continue to be on the rainfall forecast and ongoing flooding. So what about rain today. Radar isn’t too alarming this morning, but we do expect rains to fill back in a bit as the day progresses. This is certainly not what folks want to hear, but I do believe that in most cases, the rainfall *rates* will be manageable enough to limit substantial new problems from occurring. What this will likely do is lead to some rises again on area bayous that have crested and are dropping now. Those that haven’t crested will continue to rise, albeit hopefully at a slower pace, despite new rains. As we go into tonight and tomorrow, expect continued periods of rain. Most of the time, rates should continue to be manageable so that things don’t worsen, but I can’t entirely rule out some heavier rainfall at times until Harvey comes ashore in Louisiana again on Tuesday night or Wednesday morning. We figured this would be at least a four or five-day event for Houston, with the worst rains front-loaded in the first two or three days. Today begins day three, so we’re past the halfway point, and hopefully past most of the worst of the rains. That’s not to say we don’t have additional problems ahead, but our hope is that we can manage what is to come. We’ll have more for you a bit later this morning. Thanks for the sliver of hope buddy. This is a tiny bit of good news. Amen! Do you have my input on how the current projected rainfall will impact Buffalo Bayou in relation to the release of water that has already begun from the Addicks and Barker reservoirs? First off, many thanks to Eric and Matt for their great work. This website predicts a significant spike in Buffalo Bayou water levels later this week. Not sure if this is related to the release plans, but it’s this site provides the only data points I could find. Interestingly, the predictions further downstream (such as BB @ Shepherd) don’t show as significant a spike. Thanks! You guys have done a stellar job. We’re praying for continued abatement of rain in all flooded points in TX. Is that a hint of light I see at the end of the tunnel? Thanks for all the hard work guys. When this is all over, y’all need to get some serious sleep. If it ain’t raining, it’s draining, even if just an inch or two. Hold onto that. We flooded in Alison, Ike, and Tax Day 2016, 10 days before we moved to Nashville. Everything packed up neatly for the flood’s convenience to destroy. A tip: If you have flood insurance, call your claim in now & get your place in line. Watching & hoping for the glimmers of hope to brighten for our friends back & Houston and all of Texas. Love & prayers from two native Houstonians who hurt for you. It *will* end. Eric & Matt, no thanks can ever be enough for all you do. Hopefully the worst part of the rain/flooding has passed. Now time to recover, rebuild etc. And for all the global warming enthusiasts…..please keep off the comment sections since we are here to inform and help people with the current situation. @Lee, just for the record, no one is “enthused” by global warming. Thank you so much for your updates. I can’t tell you how much I appreciate your no fluff reporting and sense of humor even though this feels unbearable. The fact that you are in this too but still provide a thoughtful reports means so much. Thank you! Thanks ya’ll. Older parents with disabled son had water right up to but not in the house in Meyerland area. It has since receded almost to street. Would you wager that they’re not likely to need to evacuate at this point? Trying to provide reassurance where I can. I have seen various forcasts hoping the worst is behind us. Recovery will be long praying for all involved. Thanks for the updates. Hopefully the worst if the rain and flooding has passed. For all the global warming enthusiasts ….please keep the comments section clean of all that. People here are for being informed of the current storm and flooding situations. What is your projection for rainfall amounts in the Brazos River drainage basin? We are looking at a projected record-busting crest at Richmond that is 4.3 feet higher than the record in May 2016. Things are getting interesting in the Fort Bend levee districts. That is definitely a positive note compared to the last two days. I heard that some models indicate it is going to turn north eventually and travel east of Houston, which would be a huge relief. Is that still holding true? When do you think airports will resume flights in Houston? Click which airport is of interest, then click overview on the right. FWIW, they also say to contact your individual airline. Ive been following your blog for each update. Home is in Westbury and flooded for the first time in really scary situation. Our neighbors have been the best of people in really trying times. Reading you alls blog posts have helped me stay calm and feel prepared while my husband has been in the flood and seeking out safe shelter. I 10 west of 99 here. We got the worst of it last night with water going up the driveway. Thankfully it has receded. Should we expect the same today through Wednesday? Trying to find rain expectations for west katy. Thank you. Thank you Matt and Eric. We really appreciate your down to earth forecasts. Please give us a detailed report of what is going to happen with Barker/Addicks… they are terrifying us on the news!!! Thank you Eric and Matt for all of your updates this weekend. My dear Fulgencio and I were so comforted by your truthful information and can never thank you enough. We heed your advice and will remain vigilant this week! Ciao! Hi! I don’t know if you can answer this question, but my friend is currently in the mandatory evacuation zone for Sugarland cause they are going to open the levees. She currently has no where to go and her family all wants to stay in her home. I live in Sharpestown at HBU and the flooding isn’t incredibly bad here. We were wondering if it was worth her trying to make her way over here or should stay put or go somewhere else? Fort Bend County is calling for a mix of mandatory and voluntary evacuations because experts are worried about the structural integrity of the levees once water rises above designed-for levels. Most are designed for a 100 year flood event plus a foot or so more. We are looking at a 500+ year flood event at the moment. I believe the county judge communicated that a 900 year flood event was possible. Not evacuating in a mandatory evacuation area could mean you are putting your family at risk of a Louisiana levee breakage type of event. Please advise your friend to heed the warnings of local officials. Sienna Plantation now has a mandatory evacuation order. The Rice Village area has dried out significantly, overnight. Could drive a car again, but I am not sure how it looks outside this area. The heavy rain area on that radar shot looks like Italy.